Home News Boeing’s X-37B: Star Wars 2.0? 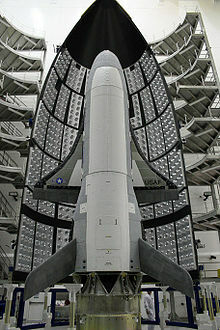 Boeing’s X-37B: Star Wars 2.0? Last week, Air Force Space Command launched Boeing’s X-37B unmanned space vehicle (USV) from an Atlas V rocket in Cape Canaveral. That much was made public. What wasn’t made public was what the spacecraft would be used for or when it’s coming back to Earth (although it can stay in space for at least 9 months at a time). The phrasing he used – ensuring that our warfighters will be provided the capabilities they need – echoes a recommendation of the Joint Operating Environment Report released last month. Because America’s 21st-century rivals see themselves as military competitors in space, the U.S. has to anticipate attacks to neutralize mission-critical technologies like GPS and the upgraded WideBand SATCOM satellites that make up the backbone of our armed forces’ command and control networks. The JOE report advocates avoiding complete dependence on a networked environment, an easily-exploitable “Achilles’ heel” in military capabilities that could be defended with, for example, an unmanned defense craft that can stay in orbit for nine months at a time. The Defense Department has been worried about a “Space Pearl Harbor” at least since 2001, and in 2007, China shocked the world by shooting down a weather satellite. That the U.S., Russia and China possess ground-based anti-satellite (ASAT) capabilities isn’t in dispute, so adding a space-based anti-ASAT defense mechanism isn’t all that far-fetched. Also, since Boeing recently tested a solid-state laser designed to disrupt or disable a boosting ballistic missile, the technology currently exists to build such a platform. The Air Force release says that new technologies on board the X-37B will “will make our access to space more responsive, perhaps cheaper, and push us in the vector toward being able to react to warfighter needs more quickly” if they prove successful, according to Gary Payton, Air Force deputy undersecretary for space programs. From that statement, it sounds like the Air Force is testing at least one Prompt Global Strike (PGS) capability.